You can design the creations you make in Photoshop Elements 13 for printing locally to your desktop printer or for uploading to a professional print service. The professional services offer you choices for covers, assembly, paper stocks, and so on, as well as opportunities to distribute the printed material to friends and family. 1Select files in the Organizer and click the Create tab. 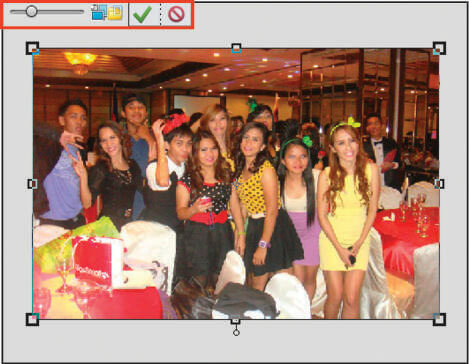 Or, open several photos in the Photo Editor, select the open files in the Photo Bin, and click the Create tab. You begin working with creations following the same procedure. You first select files in the Organizer or photos in the Photo Bin in the Photo Editor and then click the Create tab in the Organizer Task Pane or Photo Editor Panel Bin. Ideally, you might start with an album containing the photos you want to use for your photo book. You can then just click the album to display the album photos in the Organizer window and easily select all the photos or select an album directly in the Photo Bin in the Photo Editor. To select all photos shown in the Organizer’s Media Browser or the Photo Editor Photo Bin, press Ctrl+A (Command+A on the Mac). 2Open the Create drop-down menu and choose Photo Book. Whether you’re working in the Organizer or the Photo Editor, the Photo Book option is available in the same Create drop-down menu in the Panel Bin. When you click the Photo Book menu item, a wizard opens, and you can make choices for the output and the design of your creation. 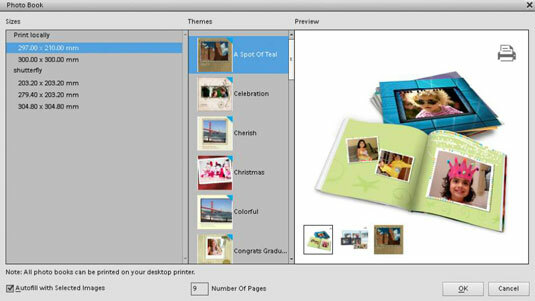 The same wizard opens for other creations, such as greeting cards, photo calendars, and photo collages. 3Choose an option for outputting your creation. 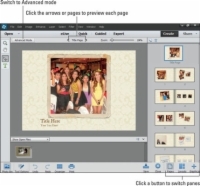 In the left pane shown, you make a choice for either printing your creation or using the Shutterfly online service. For both Print Locally and Shutterfly, you have options for choosing the size of your output. In the middle column, choose a theme for the photo book design. When you click a theme, the preview pane on the right side of the window displays a preview of the selected theme. 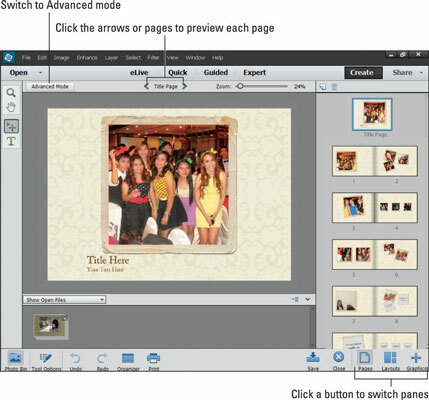 Elements uses an Adobe Flash interface where you see photo book pages automatically scroll using the selected theme. At this point, click different themes and observe the Preview pane for a dynamic display of the respective theme. Take a little time to look over all the wonderful options you have for a photo book design. The first time you use a Theme or other asset in the Graphics panel, Elements downloads the Asset to your computer. The assets are stored on Adobe’s website. You must wait until the download finishes before you can continue. 5Type the number of pages in the Number of Pages text box. By default, Elements adds a title page and two additional pages no matter how many photos you select for your album. Count the total photos you intend to use and type the number of photos in the text box. You can add or delete pages when you’re in the Creation wizard. 6Click OK and then examine the pages. When you click OK, the Create panel changes and displays three buttons at the bottom of the panel. The buttons open panes for Pages, Layouts, and Graphics. When you open each pane, you can make additional edits. By default, when creating photo albums, the pane in view is the Pages pane. In the Pages pane, look over the total number of pages for your photo book. You can scroll pages by clicking the left/right arrows at the top of the Image window or by double-clicking pages in the Pages panel. 7Click the Layouts button and choose a layout. In the Layouts pane, you find many choices for different layouts. At the top of the panel, a display of different layouts appears. Scroll down the panel to find additional layouts for One, Two, and Three photos per page. To change a layout, double-click the layout choice in the Create panel. When you change layouts, you need to populate the placeholders. Drag photos from the Photo Bin to a placeholder, and Elements fits the photo in the placeholder frame. When you see arrows pointing up or down in any of the panes in the Create panel, you can click them to collapse/expand items in the individual panes. 8Adjust a photo in a frame. If you change a layout or add more photos to placeholders, or even if you let Elements populate a layout, you may want to make adjustments for individual photos within placeholders. Zoom in or out of the photo by dragging the slider left and right. Get a new photo to place in the frame represented by the folder icon. Commit the current operation. You click the green check mark to accept your edits. Cancel the current operation. Click the last icon above the image to cancel your edits. You can also size a photo within a frame by clicking one of the handles on the selected image and dragging in to reduce size or out to size up. Move the cursor just outside a corner handle on a selected frame, and you can rotate the image and frame together. If you double-click a photo in a frame, you can open a context menu (right-click or Control-click a one-button mouse on a Macintosh) and choose from some transformation options that include scaling, perspective, and distorting the photo. Choose a menu command and drag a handle to perform the operation. You can skew an image by pressing Ctrl or Option (Mac) and dragging a corner handle. 9Click the Graphics button and use artwork. Click the Graphics button. In the Graphics pane, you can change the background design and frames and add graphics. To change the background or frames, double-click a background and/or frame in the Graphics pane. To add a graphic, click and drag the graphic to the Image window where a photo page is displayed. 10(Optional) Switch to Advanced mode to edit images and the layers. Click the Advanced Mode button to open Advanced mode, where you find more editing options. 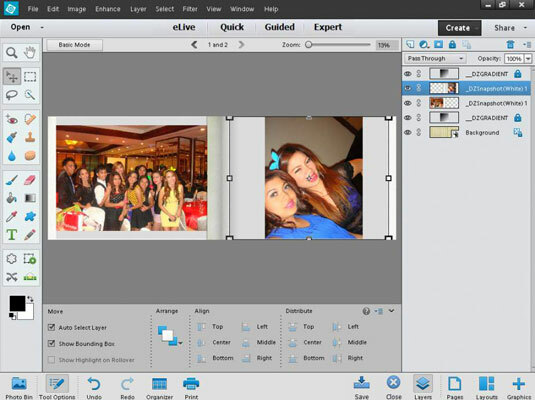 You can edit the layers for further customization of the photos in your photo book. To do so, you need to know a lot about working with layers, layer styles, and layer effects. Also, you have access to the Expert Photo Editor Tools panel, where you can apply edits to images as well as have full access to menu commands. 11Click the Basic Mode button if you’re in Advanced mode and look over the project. Now you’re ready to take the last steps to finish the project. 12When your project is complete, decide what you want to do with it. 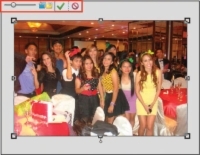 Click the Print button to open the Photo Prints pane in the Create panel. Click the Save button if you want to save your project and return to it later for additional editing. You can also save your creation as an Adobe PDF file. You can then exchange the PDF with friends and family. Click the Close button to close the project.